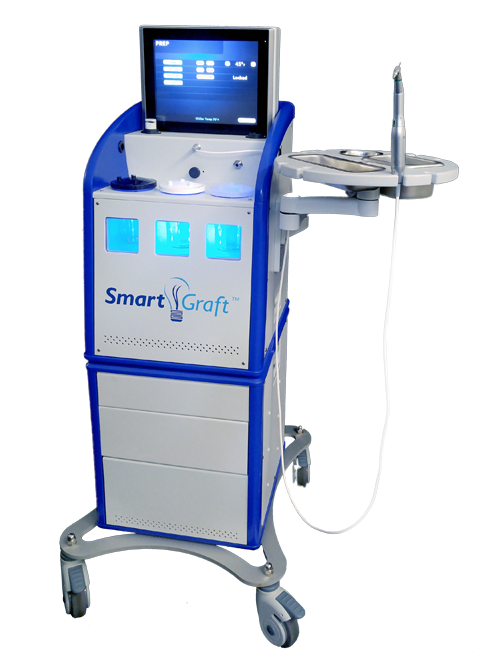 Developed by physicians, medical scientists and engineers, SmartGraft uses the most innovative technology in advanced hair restoration for both men and women, SmartHarvest Technology. This allows you to harvest grafts more efficiently, safely, and quickly, while keeping the grafts moist prior to implantation. SmartPunches – Designed to create a soft, clean and complete separation of the graft. You determine the depth and diameter of the extractions. SmartIrrigation – Allows you to irrigate the field of view for better visualization without having to interrupt the rhythm of the procedure. SmartIllumination – Superior lighting of the follicular direction and count in the donor area. SmartView – Miniature high resolution video camera displays the enhanced SmartPunch view on a high definition monitor. SmartSeparation and Count – Upon gentle extraction, grafts are separated into holding canisters based on number of hair follicles. Then they are counted and stored in a sterile solution. This significantly decreases treatment time, promotes graft survival, and increases accuracy in harvesting the necessary number of grafts. SmartStorage – Offers a temperature-controlled sterile solution mist or soak to keep grafts moist and robust while awaiting implantation. SmartDesign – Contains two modules for easy transportation.